Invite requests may be sent to mtucker@miis.edu. Interested in human rights in China? 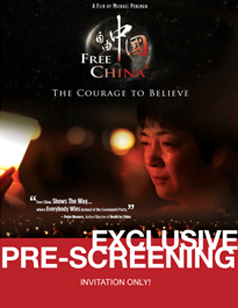 Save the date for a private screening of the award winning documentary, Free China: The Courage hosted by Amnesty International at MIIS. Join us for the film, snacks and good conversation. The documentary follows the stories of two Chinese people to highlight human rights abuses in China including imprisoning people for their religious practices, physical and mental torture, forced labor and organ harvesting. It also shows new, promising internet technologies to facilitate freedom of expression in China. We encourage everyone to come participate in an open and honest conversation about their perspectives and experiences regardless of whether they are in accordance with the film or not. Check out the website at freechinamovie.com for trailers and a full synopsis. Per our agreement with the producers, this event is by invite only. For an invitation please email Morgan Tucker at mtucker@miis.edu.